Another way of keeping the fillet nice and moist during cooking is to brine it, but I'll save that for another recipe. Ahh, tri-pepper - what's that? It's just that I mixed black, green and white cracked peppercorns for the coating. Having said that, you could use most spices for the coating. Freestyle it to suit your cupboard and taste. Trim the pork fillet, removing the "silver" skin and any unnecessary fat. Spread the pork fillet liberally with Dijon mustard all over. Put it in a plastic bag and let it marinate in the fridge for at least an hour. 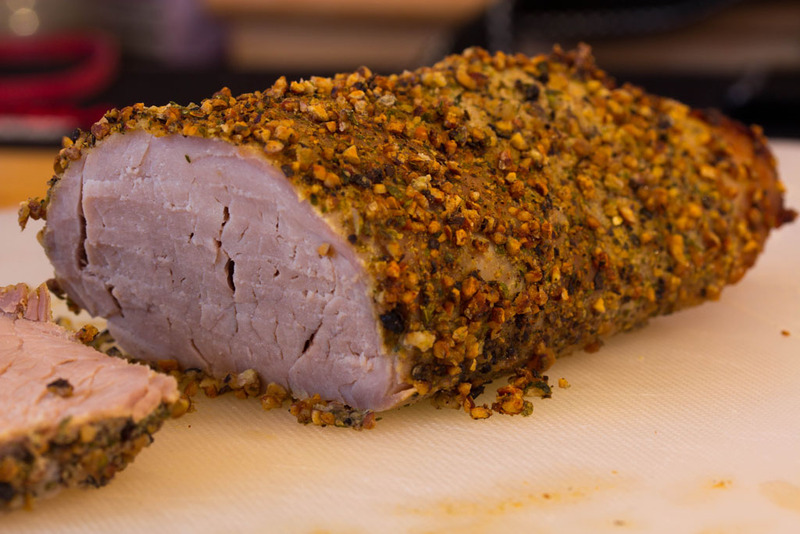 While the oven heats up remove the pork fillet from the fridge and let it come towards room temperature. Crack the peppercorns and mix with salt. Cover a chopping board with clingfilm and pour the pepper and salt mixture onto it. Roll the pork fillet in the mixture, making sure that you cover it evenly. Move the pork fillet onto a tin foil covered baking sheet. When the oven hits the temperature, pop the pork into the oven and lower the heat to 200c. Let it cook for 35 minutes. Remove from the oven and let the fillet rest for 10 minutes before cutting it. This is nice recipe get more very good recipe for delicious food.